This fast paced comedy show crackles with sparkly wit, inventiveness, lightning speed character and location changes and high velocity humour. Raised on New York but of Romanian/ German descent Lucie Pohl makes much use of her family’s background in theatrical circles where ‘drama ala carte’ is nearly almost the household dish of the day. Whether it be her father and his eternal frustrations with his printer- a common place problem many of us can identify with- her mothers own special dramatic flourishes or even her Romanian grandmother’s contributions they all create a hilarious mixture of sage advice or piquant observations wrapped up in their own individual theatrics. Add to this melting pot of crazy characters an amphetamine fuelled agent, a Greek boyfriend, aptly named Adonis and a Turkish lover. Combine the aforementioned people with a dead-end job as a waitress in a meatball joint which is abandoned in favour of a job in an ad for urinary tract infections before what promises to be the career highpoint of an acting part in a film with Michael Madsen. Well actually how Pohl finds time to breathe is a mystery as she pauses for nothing, not even breath, for the whole duration of this one hour show and somehow it never feels forced or rushed. The drama which unfolds so wraps you up in it that you simply don’t notice the hour whizzing by. Generally I am not too much of an advocate for comedy and I don’t review it too often as general rule but I thoroughly enjoyed this show finding it refreshing and funny whilst relishing the rapid fire delivery so many character changes necessitates. At the time of writing summer seems to be making a rare appearance with blue skies and sunshine proliferating over the last week. Aside from the inappropriate ratios of clothing to flesh and alcohol to body weight-typical of Scots although it would appear not wholly exclusive to them- there has not been much to complain about over the last few days. Unless of course you count the ongoing strains of the Bongos which invaded the confines of my living space via a few trustafarians at last weekends Meadows festival which certainly brought on a new condition henceforth known as ‘Bongo Rage’ in me. I don’t know what it is about a bit of grass combined with dreadlocks, lager, burnt food all topped with sunshine and open air that makes people with no talent think they are Mickey Finn (from T.Rex who also possessed little in the way of talent but at least looked amazing) and feel the incessant desire to pound away on the bongo skins aimlessly for a whole weekend. From my flat which overlooks the Meadows the resulting sound was like a constant migraine niggling away at my psyche with little relief until the Monday morning. Trying to enter the spirit of the thing I actually ventured over to see if I could soak up some of the atmosphere-usually I decamp to another part of town during this weekend- and whilst it was a reasonably pleasant experience, no doubt enhanced by Sundays glorious sunshine, I can truthfully report that bongos are even less bearable at close quarters. In fact the visual horror of seeing a bunch of hippies flailing around minus rhythm or style may have taken things to a new height of irritation. This weekend sees the return of the dreaded bongos at Leith Links festival which although I am pretty sure I am not attending I may just make an appearance at just to hurl some much needed abuse to punctuate their aimless beatings. Much more appealing however is Leith Late13 taking place next Thursday between 6-9pm on Leith Walk in 17 venues and featuring over 30 artists, musicians and performers. The previous evening I will be attending an opening for Atelier E.B. in the prestigious Inverleith House surrounded by the picturesque splendour of the Botanic Gardens. The company is the combined brain child of Beca Lipscombe and Lucy McKenzie and the event holds host to their new collection ‘Ost End Girls’ and whilst they still focus on their desires to promote the Scottish textile industry-combining it with Belgian manufacturing- with cashmeres, tweeds and other traditional fabrics they will also for the first time be showing a summer collection. A full report of the evening will be posted after the event but this is a worthwhile venture which deserves support and is open to the public from Thursday 13th until the 16th at the same venue-Inverleith house- so do yourself a favour and go along. As mentioned last week a new venture called Rammed featuring live music and DJ’S aiming to create a sonic environment is due to make an appearance in the near future. So far all I can reveal is that a date of Saturday July 6th in the Voodoo Rooms has been announced and that the headlining act is proto superstar Homesick Aldo who after causing waves on the scene over the last year or so has been locked away in rehearsals creating new material and extending his musical palette to re-launch his musical/blues experience on the public at this event. I, myself, am hoping to hear the fruits of his labours at a private open house party tomorrow night. I am admittedly very curious about both this and the new venture as I feel it is about time Edinburgh got back into trying to create some sort of underground scene which is both exclusive and inclusive at the same time. If you have not heard, or heard of, Homesick Aldo then I suggest you do and a feature which appeared on this site several months ago is a s good a place as any to start. The article can be found here. 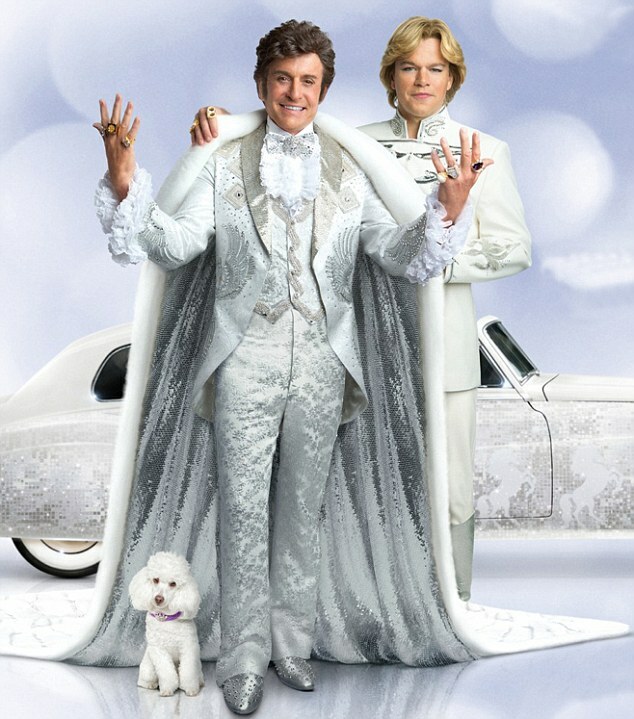 Today however I am actually strangely excited about going to see what will obviously be an over the top camp extravaganza and exposé about glitzy entertainer Liberace, Behind the Candleabra. As I am attending with a friend who himself is a camp piece of toxic outrage who minces more than a butchers equipment I am expecting my viewing experience to be accompanied by squeals of delight, salacious cackles and attempts- most likely unsuccessful- to control his desires to highkick his way down the theatre aisles whilst all the while claiming the film to be a wonder of modern cinema. However from the trailers I have seen thus far I feel I may have to suppress my own desires –total anathema to me usually I hasten to add- to follow his lead and embrace the moment! The term ‘Feelgood Movie’ is a term which can damn a film as much as commend it but with I’m So Excited Pedro Almodovar, moving away from the more serious spectre which has haunted his latest output, has made a film manages to actually leave the cinema with a grin on your face and a spring in your step. It is essentially a frothy piece of camp outrage with all the entire prerequisite bright vivid colours, attractive cast and clever dialogue his films always manage to contain. Although there is a serious message lying at the core of the films subtext-relating to the parlous state of Spain’s economy- it is never dwelt upon or clarified and remains exactly what it is: an underlying message. Opening with cameos from perhaps his two greatest stars-discounting Javier Bardem- Penelope Cruz and Antonio Banderas, who inadvertently cause the disaster the rest of the action centres on. From here the drama moves to the interior of the business class section of a plane which due to this fault is unable to land and therefore has to keep circling in the air above Toledo until an available and more importantly suitable airport becomes available. What manages to transpire during the intervening time is a farcical series of events evolving around sexual tensions and confusions which are brought to the fore by three outrageously camp ‘trolley dolly’ air stewards- crossing the border into cliche on several occasions- who decide the best way to assuage the situation is Valencia cocktails spiked with mescaline in a bid to ‘relax’ the unaware passengers of the impending disaster. Naturally the relaxing and sexually simulating effects of the drug release the tensions of nearly all concerned and the whole thing descends into an orgiastic shag-fest which has deeper emotionally resonant consequences for all involved. Unfortunately the economy class- apart from one attractive young stud who in a somnambulistic trance manages to shed a frustrated psychic of her virginity- having been fed a muscle relaxant by the cabin crew to make them less troublesome are out cold and manage to miss out on all the sexual shenanigans taking place behind the all-dividing curtain. This is an example of Almodovar’s comments about how the workers are drugged into some kind of opiated drudgery whilst those Spaniards in the higher echelons are living so much more of the high life. 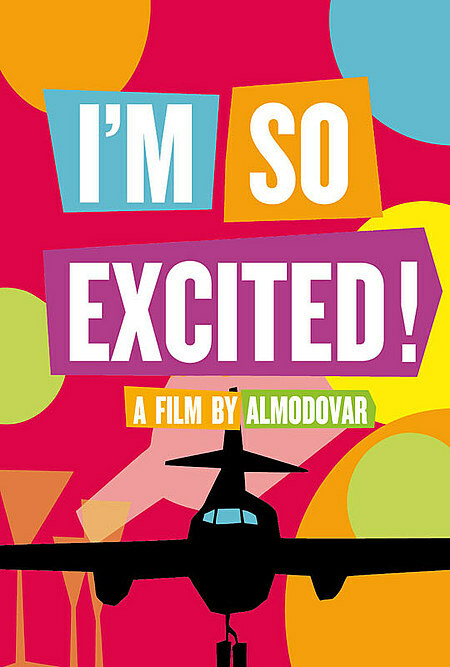 The whole film moves along at its own frantic pace and Almodovar manages to make it all seem so easy- a more than adept cast who never allow to pace to flag play a large part in this- but ultimately it is so overtly camp and carries all the facets of that- big, bright, bold and quotations in quotation marks- that any subtleties are lost in the mayhem of riotous colour. And yes there is a dance routine to go with the Pointer Sisters song the movie borrows its title from, which will have every queen high kicking their way home. It is still a good film however but it will go down as one of the more forgettable of Almodovar’s impressive and formidable canon. It may have been a way of the director getting back to his roots and letting off a little steam but I foresee his next venture will return to the more upmarket and intelligent forms we have come to associate him with in recent times. There seemed to be a bit of a buzz in the air surrounding this one and the fact it sold out well in advance merely confirmed this. Certainly there was a definite crackling energy in the foyer beforehand where old faces on the scene stood beside younger and more recent converts and by the time we were allowed into the hall a sense of expectation hung heavy in the air. Not wishing to disappoint co-founder Kevin Williamson introduced what he considered to be one of the most important pieces of poetry from the ‘80’s –by way of his concession to a Thatcher tribute/comment- and we were off into a fantastic Old Grey Whistle Test performance of John Cooper Clarke’s ‘Beasley Street’. This spoke volumes about an era of poverty, unemployment and poor social conditions which sits uneasily with recent media portrayals and rewritings which have tried to say that this was a time of prosperity and cultural growth when for many the opposite was true. This topical and impressive start led us neatly into a Canadian piece of animation by Norman McLaren which started off like one of those, once seemingly sophisticated but nowadays relegated to the status of ancient relic, early computer tennis games. It gradually worked its way into an ever evolving Test Card with a mind of its own with colours and signals colliding whilst being accompanied by a soundtrack which descended into malfunctioning android drones. The overall effect was like being electronically tickled and I mean this in a good way! First live act of the night was punk poet Jock Scot. Accompanied by a double bass and a salacious, sardonic delivery affirming his role as poet meets witty raconteur. The effect was like Lou Reed’s ‘Walk on the Wild Side’ being transferred from the back room of Max’s Kansas City to the foot of Leith Walk. The wild side of the Walk Inn if you like! The now non-existent bridge on Leith walk was given some worthy attention in its very own poem as was former Fire Engine and current Jesus! Baby singer Davy Henderson, in a reading of ‘Nectarine No. 9’. Aidan Moffat had a tough act to follow but somehow he more than admirably held his own with a set which included a song called ‘This Morning’ about the horrors contained within the world of daytime television accompanied by his rhythmic strumming at an autoharp. The rich tonal timbre of his delivery was constantly effective and re-assuring even when approaching the subjects of polygamy and Fern Britton. To round the night off the musical duo Panda Su performed a beautifully haunting set including impressive new single ‘Maps’. Meanwhile a pair of randy pandas copulated excitedly on the screen behind them though obviously not the love shy pair which currently reside at Edinburgh zoo as there has been little success in coaxing them into any such frolicsome behaviour. 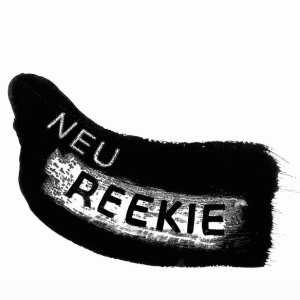 So Neu Reekie 31 finished on a subtle note then and it seemed to flow very cohesively and be over very quickly. Conversely enough number 32 had already taken place in Glasgow before Friday’s event so it will be down to Neu Reekie 33 at the end of May to carry the burden of trying to surpass this one. 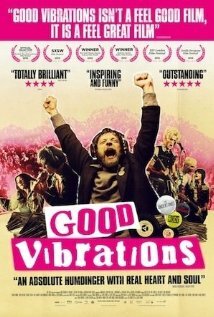 This biopic of Belfast’s punk hero Terri Hooley-the man behind the Good Vibrations record label and shop- is an excellent indictment of a time which has had little recognisable- to those present at least- representation on the screen so far. Homemade punk outfits straight from the local Oxfam and make do hair held in place by Neanderthal means- gel had yet to be invented and hairspray an expensive luxury- it captures perfectly an era which was fraught with divisiveness, generational discontent and a raw crackling energy unimaginable in the complacency of today’s disenfranchised youth who spend so much time whinging but a little less in getting off their arses and actually doing something about it. Seeing it in the week following Thatcher’s death its message was made even more poignant as the one eyed protagonist at the centre of the films maelstrom of events-an excellent turn by Richard Dormer-is the antithesis of the greed and selfishness which lay just around the corner and shows punk as the last great hurrah of youth culture before it became a packaged entity wrapped up in branding and marketing. There are none of the Mohican haired studded leather jacketed punks which emerged as cartoon clichés a couple of years on from the original punk explosion and even when this ethos takes hold Hooley manages to hang onto his credentials and kudos even to the detriment of his own personal gain. It is this which makes it a film which will have you simultaneously smiling whilst welling up inside. Sepia tinted in its cinematography so much of the sheer brownness associated with the seventies permeates every frame and gives it that perfect period detail so many have tried and failed to capture on screen before. Straying away from the obvious punk classics – The Undertones’ ‘Teenage Kicks’ which is essential to the story and Stiff Little Fingers’ ‘Alternative Ulster’ are probably the only two instantly recognisable tunes- this only enforces the films authenticity. ‘Teenage Kicks’ is the record Hooley recorded and put out on his own independent label; eventually selling it to a major for £500 and a signed photo of the Shangri La’s despite being offered a starting price of £20,000. This would be unthinkable in today’s big business music industry where artists and songs are mere product and unit shifters. Incidentally he never got his Shangri La’s photo and you can imagine that upset him more than the fortune he turned down and walked away from. Set against the civil unrest and troubles in Belfast which were at their apotheosis around this time it somehow manages to be a political film which touches little on the subject of politics. Perhaps in hindsight the spectre of Thatcherism rearing its ugly head and looming over like an encroaching shadow revealed there was much worse to come just waiting around the corner. Clever direction by Glenn Leyburn and Lisa Barros D’Sa who coax great performances out of a supporting cast which includes Jodie Whittaker and Dylan Moran keep the film continually buoyant and eminently watch-able. It is very much Dormer’s film though, in as much it is very much Terri Hooley’s story, and at its conclusion of all the emotions which have been touched upon-nostalgia, happiness, epiphany and sadness among them- hope is the one which will stay with the viewer the longest. A white Easter is not exactly what I have been dreaming of but for many, this weekend it is an actual reality. Here in Edinburgh we have been lucky in avoiding the worst of the recent weather and so far have only had to endure biting arctic winds and dropping temperatures and although there have been several nights of overnight snow usually by 11am the next morning it has melted into little more than a memory. Certainly we have been luckier than the inhabitants of Arran who have been snowed under and were without power for many days and with TV footage showing dead lambs being lifted out of the snow has been quite heartbreaking over the last few weeks. This late winter has pleased absolutely no-one apart from energy suppliers who must have been cursing the so far mild winter and seen their profits and bonuses plummeting –up until last month I was in credit on my monthly payments and coming out of a winter with Scottish Power actually being in debt to me is previously unheard of and was looking forward to a rebate- and this late cold snap will have boosted their income at the last moment as the coldest March in fifty years draws to a close with little respite likely in the first weeks of April. Despite this cold start to spring things will be hotting up at Neu! Reekie’s Easter special tonight with an amazing line up including Douglas Dunn, David Kinloch, my new fave raves Teen Canteen –think Arcade Fire meets the Shangri La’s- and a rare appearance by Vaseline’s frontman Eugene Kelly. This looks like being a memorable night for the dynamic Neu! 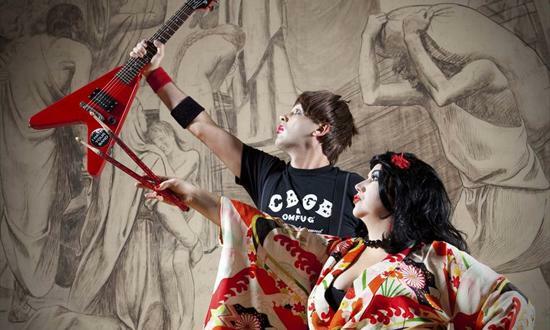 Reekie duo to put under their utility belts and having sold out several days ago anyone who has a ticket should consider themselves lucky and more than a little smug. A buzz is also circulating around a new venue opening next week in the space formerly known for decades as Negociants and soon to be renamed The Breakfast Club. If you have seen the clever and provocative ad and billboard campaigns in various parts of the city over recent weeks which feature the phrase TBC with little explanation, then all will become clear very soon. The brain child of Warren Deighan-formerly of the Honeycombe, Pop Rokit and involvement in many other venues in and around Edinburgh-this new venue has the appeal of providing a mid sized area for live music sadly lacking in the city centre at the moment. I will take a more detailed and in depth look at this upcoming venture before its opening next Friday. 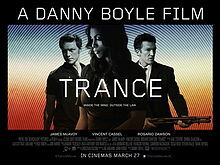 In the cinema the new Danny Boyle film Trance is the big film on release this weekend. I must admit to feeling a little let down by it however as it is following the recent incoming tide of movies which feel the need to be a little too clever for their own good and then have to resort to having the plot laid out in laborious detail merely to clarify what has been unfolding on the screen. Part of the fault lies in the casting of James McAvoy in the lead role as he never convinces as a leading man and has neither the presence nor charisma to carry off such a demanding role. Michael Fassbender was originally pencilled into play the role of underworld type Franck- a role which eventually went to Vincent Cassel- and I can’t help thinking it would have been a different and possibly superior piece of work with his presence. As it stands it is still a well crafted movie –a little heavy on the stylisation but that is not always a bad thing- with a great soundtrack by Boyle stalwart collaborator, Rick Smith of Underworld, which builds to appropriate climatic swells in conjunction with the action unfolding. It is also never dull but as said before the plot has to be explained and even then there are still considerable holes which don’t make sense. It makes sense only in a film world and therefore in that department I suppose it lives up to its expectations even if it falters in other ways. A full review here. That is it for this week then and more details to follow soon about The Breakfast Club but in the meantime have not just a Good Friday but a truly outstanding one and for those of you who are so inclined, Happy Easter!